The latest addition at The Main Place USJ 21. 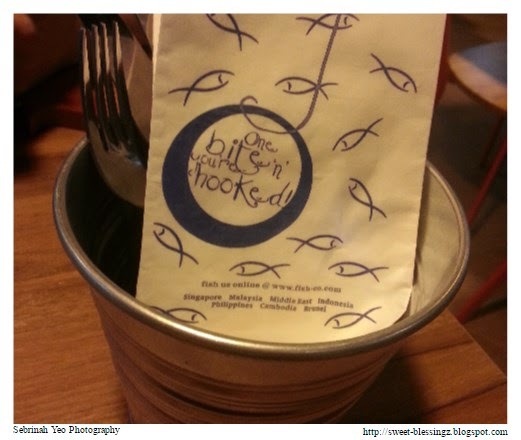 Fish & Co. restaurant, the concept similar to Manhattan Fish, serves basically anything to do with fish. The interior design is quite interesting, the seating area beautifully decorated like you're at sea. 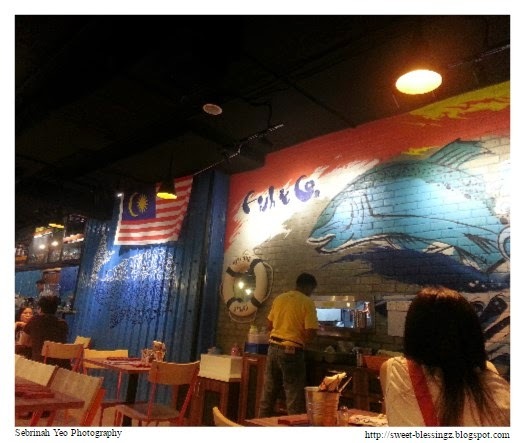 The graffiti art on the wall and the food is really good here too. 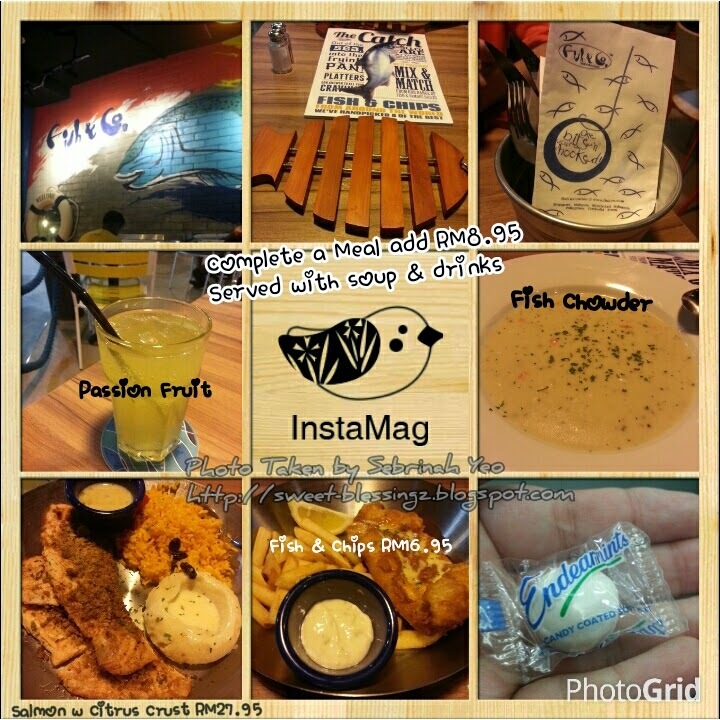 Fresh seafood, especially the fish! They had the bucket of pail with your eating utensils and serviettes. Their menu is like a magazine! There's so much to read and choices to pick inside. 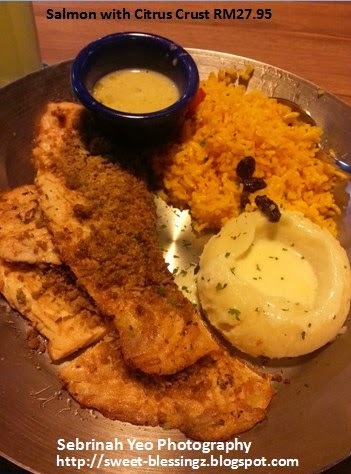 I ordered the "Baked Salmon with Citrus Crust" (RM 27.95). Salmon was baked to perfection with real citrus crust, gives a kind of zesty citrus flavour to the salmon and the salmon was fresh, not those stale types that has been frozen for a long time. The texture was perfect and moist. The side dish I picked mashed potato and rice. I love their mashed potato. I won't mind just packing-to-go their mashed potato from time-to-time. The rice is kinda sweet because its cooked with raisins but it is not dry nor oily neither is it bland, the rice tastes just perfect. The homemade mushroom cream sauce that comes with this salmon dish was quite special, it blends well with everything on the plate! If only they had nachos, it'll be a great nacho dip too! 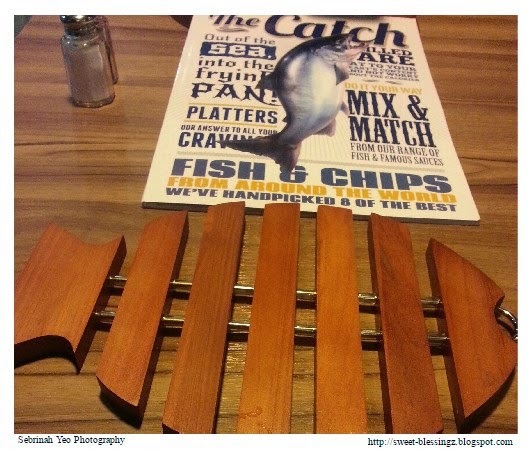 I completed my Salmon dish into a meal by adding RM8.95 for a drink & soup. We picked the "Passion Fruit" drink was zesty, tastes like Sprite mixed Passion fruit. The soup of the day was "Fish Chowder" soup tastes really good almost similar like the "Clam Chowder" available at TGIF. However, this soup is really aromatic and you can really smell the freshness of the fish in it. Don't worry, it's not the fishy smell that some people can't stand. It's a really good soup, great for starters! We opted to share a meal (me & hubs) because we're afraid of the portion will be too much for us to take (previous bad experience @ Manhattan Fish). 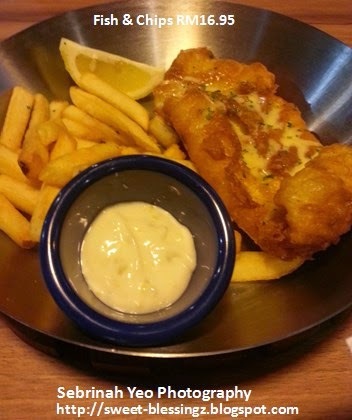 However, we then decided after that to add on another ala-carte meal "The Best Fish & Chips in Town" (RM 16.95). What can I say, the fish was fried to perfection. Crispy golden brown coated with lovely melted parmesan cheese and u can just add a squeeze of lemon to it. Served steaming hot. The fish is really fresh and not those factory-made frozen ones in the freezer where you can get at the hypermarkets. It's real fish, though I have no idea what fish, didn't really read the menu. Was too hungry. But it's not dory fish, atleast it doesn't taste like dory fish. I love it! Hubby love it too! Ps. It's abit oily though, guessing it was deep-fried. I would love to come back again. After getting the bill, we were given a mint sweet together with our change and receipt. You won't find these kinda gesture at restaurants no more. Lovely~! Drop by with your family & friends or you can even come here on a romantic noisy dinner for two, but you won't be disappointed. You can check-out their menu here.